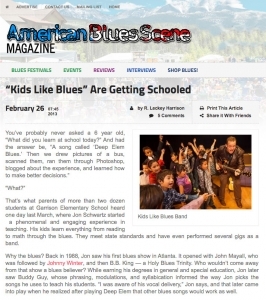 Teacher Jon Schwartz started a phenomenally engaging teaching experience using blues music. His kids learn everything from reading to math through the blues. They meet state standards and have even performed several gigs as a band. Why the blues? Back in 1988, Jon saw his first blues show in Atlanta. It opened with John Mayall, who was followed by Johnny Winter, and then B.B. King — a Holy Blues Trinity. Who wouldn’t come away from that show a blues believer? While earning his degrees in general and special education, Jon later saw Buddy Guy, whose phrasing, modulations, and syllabication informed the way Jon picks the songs he uses to teach his students. “I was aware of his vocal delivery,” Jon says, and that later came into play when he realized after playing Deep Elem that other blues songs would work as well. Is Jon a rebel? No. His own school’s principal suggested that he bring his guitar to see if he could do better than teach phonetics using “Old McDonald’s Farm.” Jon chose “Deep Elem Blues,” and things took off from there. A conscientious teacher, Jon is frequently in contact with parents about song choices, the progress kids are making in recording and blogging about songs, and what songs are coming up. He takes any objections parents might have seriously and has great community support as a result. Jon has been recognized by the California Senate for his skills, has presented and played for the Cal State San Marcos School of Education, and recently submitted an article to Education Weekly. He and his kids have also appeared on radio and TV.